UAE is one of the best countries in the world to live. Therefore, millions of people travel to UAE in search of job, doing business and completing their studies. It is also a country that strictly follows rules and regulations. Without proper documentation and papers, the government will not grant you UAE visa. UAE embassy attestation is one such thing without which you will not get visa approval. UAE embassy certificate attestation is essential in order to prove the authenticity of the documents provided by you. UAE embassy attestation is needed for getting a work permit or starting a new business in UAE. As a country that strictly follows rules, it is mandatory to get a proper embassy certificate attestation. Otherwise, the UAE government can reject your application. UAE embassy certificate attestation is necessary for getting admission in schools and universities of UAE, for sponsoring the spouse, for getting family visa etc. It is mandatory for getting business licenses in UAE. The type of visa that you applied for determines what types of document you need for attestation. For example, if you are planning to go to UAE for starting a business, you need to provide commercial certificate for attestation. If you are applying for family visa, you need to provide the marriage certificate and birth certificate of the child. HRD Attestation: Attestation of educational documents from the state HRD of concerned state. HRD attestation is mandatory for UAE. MEA Attestation: In this second process, certificates are attested from the Ministry of External Affairs. 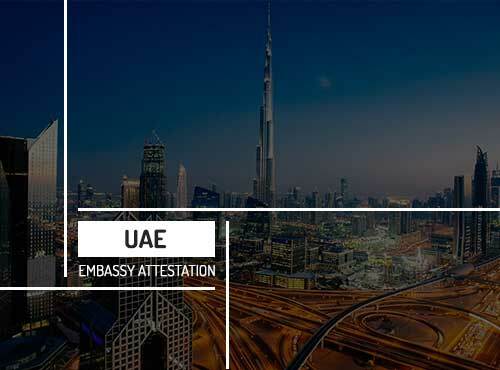 Embassy Attestation : After MEA, certificates are attested from the UAE embassy/consulate in India..
MOFA UAE: Verification and attestation of your documents from Ministry of Foreign Affairs. Urogulf has over 19 years of experience in embassy attestation services all over India and the Middle East. We provide attestation for all types of educational, commercial, private (marriage certificate, birth certificate etc.) and medical certificates. We have a wide network of experts for doing embassy attestation process directly through government agencies. The main advantage of having UAE embassy certificate attestation from Urogulf is that you will get your certificates attested within a limited time without any worries. You can track the status of your certificates through our website whenever you want. Our Services are available in the major cities in India. We provide our services for different countries in the Middle East. To know more about our embassy attestation services, contact us through our website www.urogulf.com. Any Indian who intend to travel to UAE for employment or education purpose should get their certificates attested from UAE embassy in India. In India, UAE embassy is situated in Delhi. UAE embassy services are provided through the consulates in Mumbai and Kerala. Urogulf helps you to complete the entire embassy attestation procedures from UAE embassy in India. We provide our services through UAE embassy in Delhi, UAE embassy in Mumbai, and UAE embassy in Kerala. Urogulf also offers certificate attestation in UAE, MOFA, Indian embassy attestation from UAE. They were really helpful & humble enough as I’m complete new to all these process things. But they didn’t make me feel low. Over all my experience with Urogulf & my stay in Dubai is really awesome!!!!! Would definitely recommend *Urogulf* & the *Beautiful Dubai* to my frnds n relatives.